Find High Quality Cockatiel's cages, food, treats, toys and accessories from all major brands. 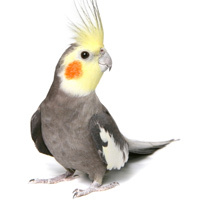 Large selection healthy Cockatiel foods, treats and supplements to keep your pet looking and feeling amazing. Selection of safe cages, toys and accessories, designed with Cockatiels in mind to keep them active and mentally stimulated. No need to look any further for your Cockatiel's Supplies. Find what you need right here at Parrot Essentials. We carry a variety of nutritious foods, toys, cages, and accessories. Provide your Cockatiel with a safe place to call home. When picking a cage that’s right for your bird, consider the security, quality, and convenience. Those 3 factors, we assure you, can be found when selecting a cage from us. Our cages have been approved by the World Parrot Trust, are lightweight, easy to clean, and superb quality. Need to travel with your Cockatiel? No worries, we have travelling cages that make your journey easy. Not only do we have cages, but a great selection of stands. Stands are important when providing your bird with “out of the cage” time. Choosing a perch that is large enough to keep your Cockatiel exercised is achievable with all of our different sizes and add on accessories. When your Cockatiel spends time in their cage, it’s important to be able to keep them mentally stimulated. This, is easy to achieve, with our training toys, swings, chewing and foraging toys. Teaching your Cockatiel new tricks is easy with our impeccable selection of healthy, nutritious treats for your learning bird. To meet your Cockatiels individual needs/preferences, you can choose between many flavors like; honey, sweet potato, palm nuts, cinnamon, pineapple, dried chillies, and many more. In addition to treats, we carry high quality Cockatiel foods. Pick between several top options that feature mixtures packed with vitamins and minerals, foods that are easy to digest, and formulas perfected to fit your bird’s daily requirements. We have, seeds, fruit and vegetable mixes, plumage enhancer, and more. Giving your bird a little healthy boost is made possible with our vitamin supplements, powdered nutritional aids, refreshing aloe vera sprays for the skin and feathers, nourishing shampoos, creams, and many other products. All of these products are tried and tested and veterinary formulated, ensuring that your bird gets the best care.